I got my November bulletin board up and wanted to show it to everyone quickly so you could get the idea. This is a coloring and cutting activity. I put up a turkey shape and a pocket with feathers in it. 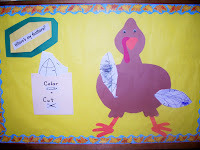 The children color the feathers, cut them out, then we add them to the turkey. Pretty simple, but he'll look pretty great by the end of the month. Great Idea! Consider it stolen! Very cute!! Your turkey looks great! Another idea- at home, parents can make a small turkey and write what each family member is thankful for on each feather. Take Care!